Taking a serious view of the illegal sale and purchase of houses constructed under the Ambedkar Awas Yojna, the National Commission of Scheduled Castes and Scheduled Tribes has asked the Chandigarh Administration to cancel the allotment of these houses to hundreds of people who are occupying the houses despite being not belonging to the SC or ST.
Today is the happiest day in the lives of Rajwati and Aalam. The childless couple living in a slum in Phase 1 here has ‘adopted’ a three-day old girl child found abandoned on the Kharar-Ludhiana road this morning. Nothing short of miracle, the child, abandoned two days ago, survived the biting cold and hunger. The auction of commercial property by the local municipal corporation today saw a mixed response as only 35 out of the total 99 could be sold. Those in prime locations were sold off at good rates. In other cases, the MC had to withdraw the sites due to lack of good bids. 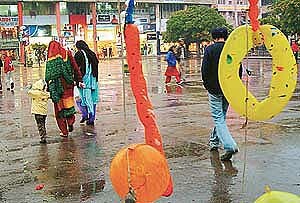 Shoppers look for shelter as rain catches them unawares in Sector 17, Chandigarh, on Wednesday. The city and its surrounding areas continued to reel under the cold wave conditions as rain lashed the area intensifying the cold wave conditions. The local Met office said the rain and cold wave conditions would continue tomorrow. Over three decades after it first flew in Indian skies, the workhorse of the IAF’s helicopter fleet is on the way out. Beginning this year, the Air Force will be de-commissioning old Mi-8 choppers which are too old to meet statutory flying requirements. Dr Geeta Hooda, nee Grewal, daughter-in-law of Mr Bhupinder Singh Hooda, today alleged that someone tried to hit her car on the busy Kalka-Ambala highway, near Dera Bassi, last night. Lantana camara, commonly known as ghaneri, has spread its tentacles in and around the Sukhna Wildlife Sanctuary and other forest areas of the Chandigarh, resulting in decline of biodiversity. Concerned over its menace, the Forest Department, Chandigarh, started an eradication drive in 2001 which will continue till 2006. The department plans to weed out from 1,000 hectares of the sanctuary (about 50 per cent of the total area) and 370 hectares from other forest areas, including the Sukhna choe and the Patiala-ki-Rao. In the absence of data about the number of landmine victims and the extent of the problem in India, the International Committee of Red Cross, will launch a hunt for the affected persons all along the border areas in Punjab, Jammu and Kashmir and Rajasthan. Focusing on the need to explore and link up mid-West and Central Asia with India to make headway in the strategic and economic areas, the international seminar on “Language, Culture and Society in mid-West and Central Asia,” which began at Golden Hall, Panjab University, here today, emphasised on the need to look beyond Pakistan. Even after two years, the government is yet to resume the excavation work at the historic Chatt village, which yielded artifacts and ruins of the Harappan civilisation, thanks to the paucity of funds. The PGI might cry itself hoarse about acute shortage of funds when it comes to routine hospital expenditure, but is magnanimous in shelling out Rs 30.89 lakh for the 59 window-type airconditioners, that too in areas which are already centrally airconditioned. The Iraq war was over with the capture of Saddam Hussein. The ramification of the war, now is manifesting itself in the changing world order. Though the “might is right” belief of the Americans dominated the war period in Iraq, post-war the countries are faced with the option of going it alone, like the US did in Iraq, or working collectively to establish a new world order. A two day “Conference on e-security, cyber crime and law” will be held in the city on February 19 and 20. The Mahatma Gandhi State Institute of Public Administration, Government of Punjab in association with Society for Promotion of IT in Chandigarh is organising the conference at Hotel Shivalik View. The police started a verification campaign in the township here today. As many as 180 persons were verified during the first day of the campaign at the Phase 1 police station. The Coordination Committee of the Survey of India Association held a meeting yesterday to express concern over the restructuring of the Survey of India saying it suits only the Class I officers. The interests of Group B, C and D employees have been crushed and their numbers pruned. The National Adventure Club (India) will organise the 10th National Adventure Festival from February 1 to 8, here. Mr Ram S. Varma, President of the National Adventure Club, said here today. The Tribune Employees HP Helpline Cultural and Welfare Society, Chandigarh, will organise its third annual “Parivar Milan Samaroh” here on January 26. Free Press of Nation (FPN), a multilingual news and feature agency, was inaugurated here yesterday. The English version of the agency was inaugurated by The Hindu correspondent Sarbjit Pandher. The Hindi version was inaugurated by senior journalist Pushp Kumar Singh and the Punjabi version by Ajit correspondent Baljit Balli. The inauguration ceremony was organised at the seminar hall of Punjab Book Centre. The autopsy report of the girl child allegedly killed by her mother, Geeta, in the PGI has established that she was strangulated to death. The police has taken samples of Geeta and her daughter for a DNA test to establish the infant was that of Geeta, the police said. The police today arrested one person on charges of kidnapping a minor and keeping her in illegal confinement. The accused, Malik-ul-Islam, was arrested from Muradabad by the Mohali police team yesterday, four months after a case under Sections 366 and 363 was registered against him. The crime branch of the Chandigarh Police today claimed to have unearthed a gambling racket extending to Delhi, nabbing an operator from Bapu Dham. Ashok Kumar, alias Khappu, was arrested along with a gambled amount of Rs 20,150 from Bapu Dham. Ashok Kumar is touted as one of the biggest operators of the city, according to the police. Masterline Chandigarh has ventured into Windows-powered GSM mobile pocket PC with the all-new Qtek 2020 which was launched in the city today. Qtek 2020 will be one of the first Windows-powered GSM mobile phone to be launched in India, according to Mr Naresh Nanda, managing director of Masterline. Harsharan Singh, a class III student of Tender Heart School, Sector 33, was adjudged the winner of this week’s nationwide lucky draw held by Fun Stop, a popular name in board games, puzzles and craft series. 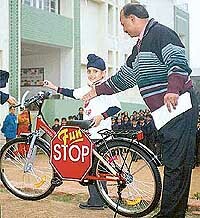 Harsharan Singh was presented with a bicycle by Mr Ajay Aggarwal, Regional Manager. The Fun Stop range of products are for creative minds and entertaining as well as educative. The University of Glasgow, one of the United Kingdom’s oldest and most prestigious universities, in association with Study Overseas, UK, will hold a counselling session for students here on January 29. Classes in colleges of Punjab and Chandigarh remained effected as hundreds of teachers of non-government colleges under the banner of the Punjab and Chandigarh College Teachers Union held a rally demanding regularisation of salaries and retiral benefits opposite the Punjab DPI (Colleges) here today. As many as 464 students from 15 schools in the township participated in ‘Camlin Freedom’, an inter-school painting competition organised by Creative Institute of Visual Arts at Sanjay Public School, Sector 70, here today. A house made well is a house well lived in. 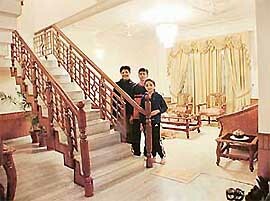 This is how one can describe the home of Mr Bal Mukand Sharma known across Punjab more for his comedy shows than as Deputy General Manager, Markfed. His house, located in Phase 3B2 here, is an example of flawless symphony between the exterior and the interior. Korean scarves are creating ripples among the youngsters of the city. Also popular are shiny scarves with tassels that promises to leave you beaming even in cloudy January days. Net scarves are also in vogue among teenagers of the world. Just in case you have not purchased the scarves till now, drive down to the arcade, now. You will find imported scarves in baby pink, oceanic blue, icy white and green hanging outside garment stores and artificial jewellery shops all over the city. This stuff is not very expensive either. You can buy a scarf anywhere between Rs 250 and Rs 450. The stoles and shawls are priced anywhere between Rs 600 and 1500. Lunches and dinners out in the corporate world are generally linked with work. 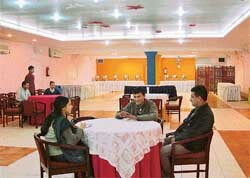 The businessmen like to unwind over a meal with their dealers, distributors and other associates after a brainstorming session of a seminar or conference. And for such occasions, a venue that caters to their business as well as culinary needs is sought. One that should be spacious. It should have the latest gadgets (OHPs, telephone connection, Internet, fax etc). Mega pharmaceutical companies and the District Health Department are on a collision course the issue is pricing of certain essential drugs. 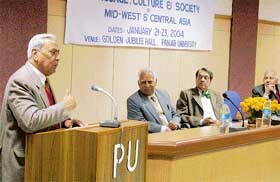 The UT Administrator, Justice OP Verma (Retd.) today underlined the need for taking preventive measures for eye care. Speaking after releasing a book entitled ‘Guide to Healthy Eyes’ written by Dr R.Kumar, senior consultant and eye specialist at Punjab Raj Bhavan, Justice Verma said eyes may be the first indicators of a change in our body health like diabetes, hypertension and brain tumour. Stressing upon the need for a regular drive to check food adulteration, The UT Administrator, Justice O.P. 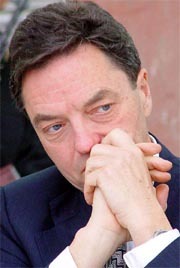 Verma, yesterday ordered the regular sampling of food products in the city. He said an Executive Magistrate or SDM should accompany the team of the Health Department to rule out harassment. DAV Senior Secondary School, Sector 8, Chandigarh, entered final of the PCA Parle Inter-School Cricket Tournament for under-17. 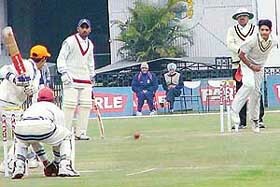 Tournament in Mohali on Wednesday. Tennis eves of Panjab University bagged the bronze in the just concluded All-India-Inter Varsity Lawn Tennis Meet held at KSLTA Cubbon Park, Bangalore. In this meet, Osmania University, Hyderabad, won the gold, while Madras University, Chennai, the silver. The senior most Inspector of the Chandigarh police, Mr Daya Nand, was today promoted as DSP, a position which he held for 11 years before being demoted in 2001. His elevation was on a direction from the Central Administrative Tribunal. Station House Officer of Sector 26 Tirath Singh was today replaced by Inspector Jarnail Singh, who was additional SHO in Sector 17 prior to the posting. Mr Tirath Singh replaces Mr Gurnam Singh in the Police Control Room. The latter has been posted with the Sector 17 police station as Additional SHO.